Student teaching has been going well so far with my one complaint involving how ridiculously early schools start these days. Despite enjoying being in the classroom, I still enjoy my weekends and would not want to spend them at school. The exception to this is when I decide to school some fish. This weekend was a blur of driving, visiting friends and family, cutting down a couple trees, and just when I thought that was enough, I decided that I better throw in some fishing. Spending the weekend at Nashville has advantages and disadvantages. The main disadvantage being that it is a bit farther then I really like to drive on a weekend but that mainly stems from pure laziness. The most obvious advantage is that I can swing by the Caney Fork on the way back to Chattanooga and only be going slightly out of my way. I arrived on the stream somewhere around 2:00 pm Central time and quickly got into some brookies. 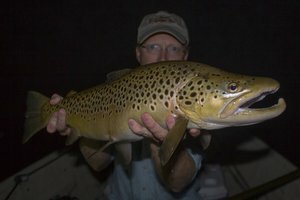 Quickly growing tired of these easy targets, I decided to take the game into some technical slow moving water where nice browns like to sit and feed just above the lush weedbeds. 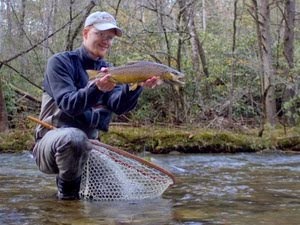 My Legend Ultra 7'6" 3 weight was the perfect tool for stalking these wary fish, and in the end they proved to be no match for the deadly zebra midge. 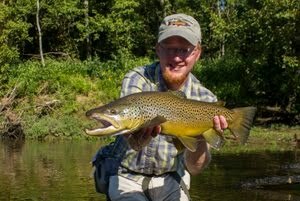 I caught several nice browns to about 15" or 16". Strangely all were females and as fat as they were, I strongly suspect they are full of eggs or at least getting there as the spawn is most likely just around the corner. 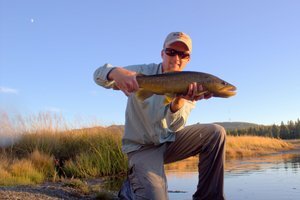 Several of the fish buried themselves in the thick weeds on the bottom of the river and it was only through a lot of effort that I wrestled them back up and to the surface. As a side note, I am extremely impressed with Rio Fluoroflex Plus tippet material. It is cheaper than the Seaguar Grand Max that I like so much and is also exceptionally strong. 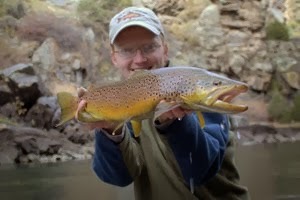 I didn't lose a single fish today and I believe that a lot of that is because of the quality of the tippet. Wow, nice view of the belly in that second shot. Getting me pumped about what is just around the corner. I am taking my son to the mountains this weekend for his first visit and some photos, maybe I will see you up there.